Update (7:45): UTPD spokesperson Cindy Posey said all of the residents at 21 Pearl are able to return to their apartments permanently. "They won't need [emergency housing] anymore," Posey said. "They'll be able to go back to their apartments." One male student died and five people were injured in a hazmat situation involving hydrogen sulfide Wednesday afternoon at 21 Pearl, a student apartment complex in West Campus. The deceased is a male in his 20s who may have died by chemical suicide, according to Austin Fire Department Chief Palmer Buck. Three victims, one male and two female, were transported to University Medical Center-Brackenridge. Other residents of 21 Pearl affected by the chemicals refused treatment. Authorities initially responded to 21 Pearl for a cardiac arrest. Francoise Luca, spokesperson for the complex, said she did not know if the deceased student attended UT. “Tragically, the student resident died, and one of our staff members was taken to the hospital for evaluation,” a press release from 21 Pearl management said. UT said in a statement that “most of the residents of 21 Pearl are UT Austin students,” but did not confirm whether the deceased student who died of exposure to hydrogen sulfide was a UT student. Luca said the apartment complex staff member who was taken to the hospital is in stable condition and will hopefully be released today. They are working with the authorities to ensure the complex is safe to live in again, Luca said. “We’re working with the authorities to give us more instructions and to allow our residents back into their apartments,” Luca said. The authorities said they are not sure when residents of 21 Pearl will be let back into their apartment complexes. The hydrogen sulfide levels are “very low” at the apartment complex, and pets in the building should be safe, according to Buck. Management at 21 Pearl, which is managed by Lee Properties, did not respond to repeated phone calls for comment. UT media outreach director J.B. Bird said the Dean of Students is working with students who were affected by the hazmat situation at the apartment complex to provide them with shelter. Bird said affected students can call the Student Emergency Services number to receive help. Students affected by this incident can also call 512-471-5017 to receive emergency overnight housing. Chinese junior Phan Nguyen, who was sleeping when the incident occurred, said her roommate woke her up and told her to evacuate the building because a “mysterious smell” was emanating from one of the units. Nguyen said she has “several friends around the area” but doesn’t know where she is going to stay for the night. Nguyen said she doesn’t have respiratory problems, but some of her roommates do. 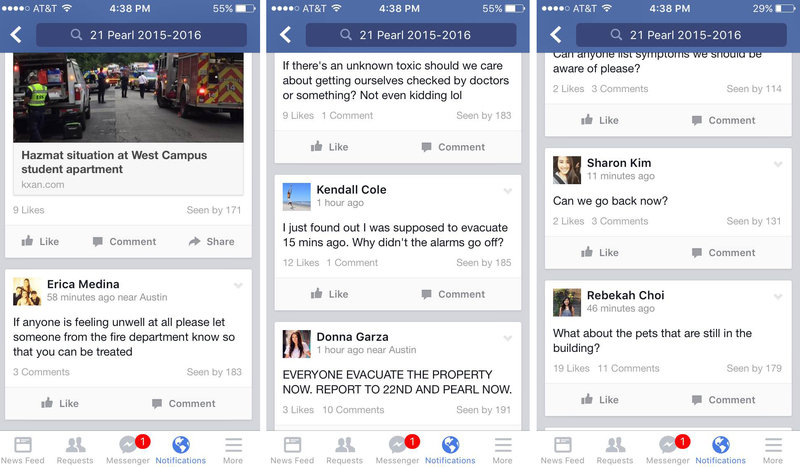 According to Facebook screenshots provided to The Daily Texan, apartment complex managers told residents via Facebook to evacuate the building and make sure they are “checked out” by the fire department if they were feeling unwell. 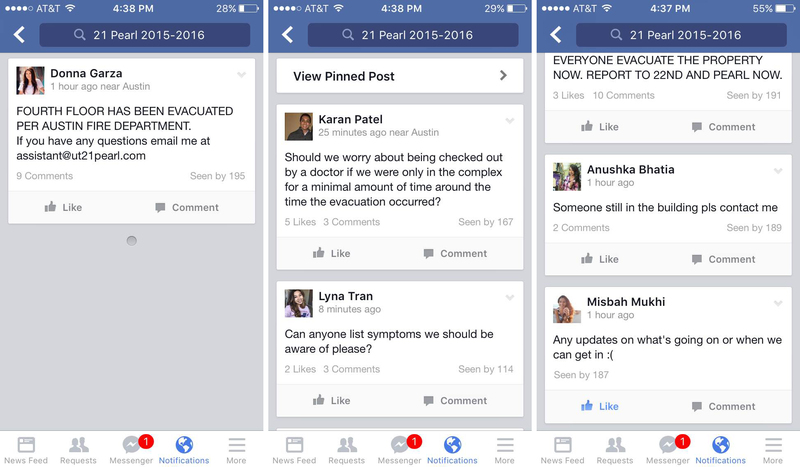 Screenshots from the 21 Pearl 2015-2016 Facebook group, which residents can be a part of. 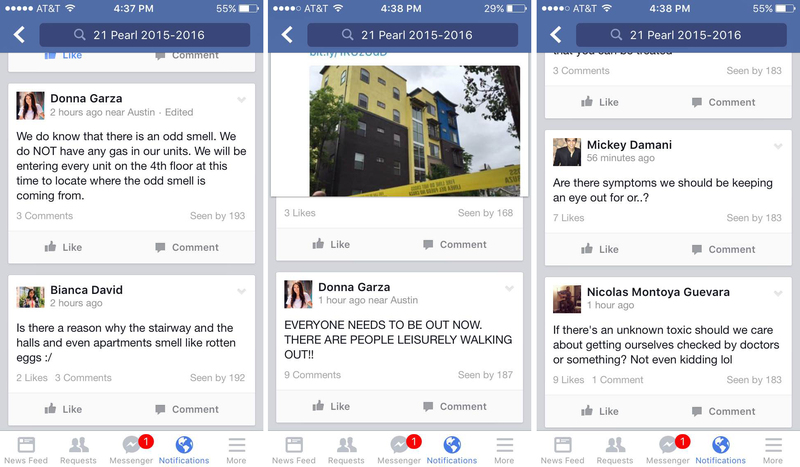 Donna Garza and Lisa Alexander are the admins of the page and work at 21 Pearl, and they alerted residents through Facebook and by knocking on residents' doors. Residents can enter through the garage to pick up their cars by walking around the building, property manager Crystal Gonzalez said. This story has been updated since its initial publication. We will continue to update the story as we get more information.